A long-neglected memoir of the Russian campaign, first published four years after its protagonist’s death. At the end of his life, Napoleon allowed that he had made three big errors: he should have made peace with England at the end of the Peninsular War, should have restored the Kingdom of Poland, and should never have tried to invade Russia. But invade Russia he did. When his Grand Army began its campaign against Tsar Alexander’s forces in 1812, it was half-a-million soldiers strong; so worked up were they at the prospect of trouncing the enemy that elements of the advance guard came to blows over who got to cross into Russia first. Only 10,000 French soldiers made it out of Russian territory just a few months later; the rest died of Russian bullets, starvation, or the awful cold of winter. 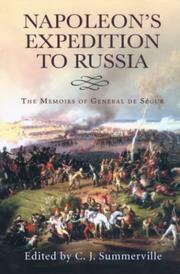 De Ségur, a general in charge of logistics, was on hand to witness this slaughter and Napoleon’s foul moods; though no Tolstoy, he offers in these pages eyewitness accounts of such signal battles as Moscow and Borodino, which left the Grand Army “blackened with powder and spotted with blood; and yet, in the midst of their rags, their misery and disasters, they had a proud look; and at the sight of the Emperor, uttered some shouts of triumph; but they were rare and forced.” De Ségur, a proud patriot, takes care to portray his fellow soldiers as brave and selfless men, though he fully recognizes their all too human frailties, as when the exhausted and fatigued infantry discovers “a spirit distilled from grain . . . used instead of wine and brandy made from grapes”—vodka, that is, which seems to have taken as many victims as shrapnel. He treats his ruler more circumspectly, but, reading between the lines, we find in his pages a Napoleon of rueful and uneasy countenance, stricken by disease and remorse, far from the stoical leader generally portrayed. Savaged in its time for its unblinking portrait of an army destroyed piece by piece, this account should interest military historians greatly.